"Champani Devika" is a name from a long time ago. I remember seeing this name scrawled under paintings reproduced in the Island and the Divaina. They were elegant creations clearly the product of someone who knew line and colour, but what really made me "look" for them every week was the few lines of poetry that accompanied the picture. I cannot forget the pastel shades, the blending of images and the kavi sankalpana that complemented these because I used to cut and collect them; for the politics, the philosophy and poetry. All names have flesh and blood behind them. They have childhoods, there is growing up and learning. "Champani Deepika" is not an exception. The question "who is she?" (or "who is he" for that matter) often draws forth a person in all the colours and tones that make up a personality. In an artiste, these shades can be bold or soft, the lines faint or strong. The picture always demands a lingering gaze. Champani Devika was born in Biyagama. Her father, who later became a principal, used to teach painting and geography. Interestingly, her father never formally taught her to draw, and yet he did encourage her as a child. "He gave me books and colours and allowed me to draw on the walls of the house. In fact the house was not colour washed until I was 10." Unlike other children who would wait impatiently until their fathers came home to explore the pockets for sweets and chocolate, Champani was only interested in taking the pieces of chalk he brought home. She used to trace the cracks in the cement with her colours and this may very well have helped her master the "line". There would have been general recognition of the young girls latent talent in the family circle for all the gifts she received on birthdays or when she did well in school were pastels and water colours. She used to come home with her uncle, who taught in a nearby school. She would wait in his class until the lesson was over. Her uncle used to draw a line on the blackboard, separating a section for her to doodle. Champani secured the best results in her school, Biyagama Maha Vidyala, at the NCGE and qualified to enter the science stream. "I wanted to enter the arts section, but no one in the family approved. There was a teacher named Subadra Jayasekera and she was the only one who supported me. I cried and insisted that I be allowed to take the subjects of my choice. Finally, my father relented, but not before making me promise that I would not blame him later on in life." As things turned out, she hasnt had reason to complain. She had taken Sinhala, Buddhist Civilisation, Art and Economics for her Advanced Level Examination and entered the University of Kelaniya where she completed her degree in Fine Arts. 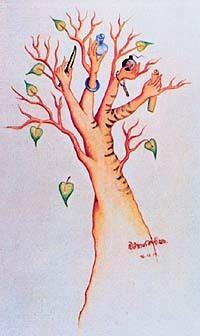 While in the university, Champani had held two solo exhibitions. 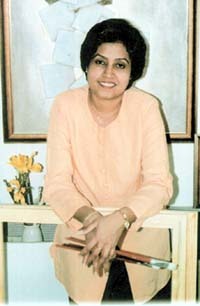 She had been the first woman to hold an exhibition at Kelaniya. What we and what we become is but a collage of the pieces of earth that we have walked, and Champanis work is a good example of this. She began her career as an artist for the womens weekly, Navaliya, in 1985. During the same year she was awarded a scholarship by the Chinese government to learn Chinese at the Beijing Language Institute. She went on to follow a course of advanaced studies at the Central Academy of Fine Arts in China, from 1986-1988, and later completed a Masters in Fine Arts at the same academy. Her thesis was a comparative study of frescoes in Sri Lanka and China. 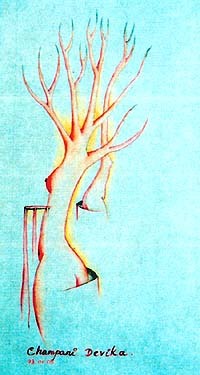 She returned to China for six months in the early nineties to study Chinese traditional paintings and in particular the kum-bi technique, i.e. the use of the "fine brush". "I felt a certain affinity to this technique. In fact this became popular on account of the things I painted for the newspapers, so I continued with this style"
Artistes teach us many things. Some artists are by profession teachers. Champani has worked as an art teacher from 1993. She has also been a visiting lecturer from time to time at the University of Kelaniya and the Post Graduate Institute of Archaeology, where she has taught Chinese Art History and Painting. Typically, most painters are not known outside the fraternity of painters and close associates. That Champani is "familiar" to a wider audience is perhaps due to her contributions to the Island and the Sunday Edition of the Divaina. She drew for the Saturday Magazine and the Tuesday Magazine of the Island between 1991 and 1996, Sisira Pathiravithana translating her poetry into English. 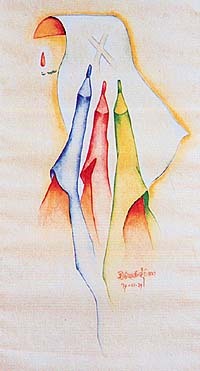 Her contributions to the Divaina has been relatively small, 20 paintings between 1992 and 1993. Champani believes that she learnt the practical "basics" of painting in China, where she had to follow a strict and disciplined course of studies and could develop her fascination with the rekhsva . It was from China that she "picked up" light colours and these have been a virtual signature in her paintings. She had been particularly interested in "Scholars Paintings". She explained, "they were educated people who could pain and could also write poetry; there was philosophy in what they drew". She too had written poetry from the time she was a child, but it was in China that she realised that what she had practices had actually been an ancient tradition. "I too have a philosophy or a dekma. This is heavily influenced by Buddhist philosophy. I am inspired by the pancha seelaya (The Five Precepts) and the madyama prathipadava (The Middle Path). My paintings are neither artificial nor totally natural, but something in between these extremes and are political commentaries of a kind. I use symbols, like many others. You might notice that the vast majority of my paintings contain a Bo leaf. This represent my kinship with nature and Buddhist philosophy. Since her first exhibition held at the University of Kelaniya, Champani has held nine solo exhibitions, both in Sri Lanka and in China. Her 10th exhibition will be held at the Allah Bux Art Gallery in Lahore, Pakistan. The exhibition has been organised by her artist friends in Pakistan and will contain 37 paintings along with the relevant poetry. 1998-2000 To study paintings...in China. Champani says that although there have been painters who have admired and appreciated her work, her contemporaries in Sri Lanka have been mostly critical. When I told her that I used to cut and collect the ones that appeared in the Island and the Divaina, she said "you know, almost everyone I have met have said that". How does one really measure the worth of a painter? Popularity? In a sense, yes. The truly great are loved by the people and by students of art who can differentiate the exceptional from the excellent. In the end, time will also count, for the exceptional is timeless, so to speak. Champani touches a chord in our hearts because she employs her keen perception and mastery of colour and line to lay bare the human condition, both in the timelessness of certain subjects, and the immediacy and persisting character of the political moment. Let the art critic have his comment. For now, at this stage of her career, she can be happy that she is being "read". And appreciated.